otel "Eney" is a boutique design hotel and is located in the most beautiful, green and quiet area of the ancient centre of Lviv near Medical University and not far from museum of architecture “Shevchenko’s Grove” and Lychakiv museum. 15 min. walk to Opera Theatre, central Market square and Tower, Historical Downtown, where most of attractions, museums and stores are located. There is secure parking lot on the hotel premises, which is rare for the center of Lviv. Also unique for the central part of our city is an open air heated swimming pool with a heated terrace. There is free Wi-Fi in each room and in all areas of the hotel. 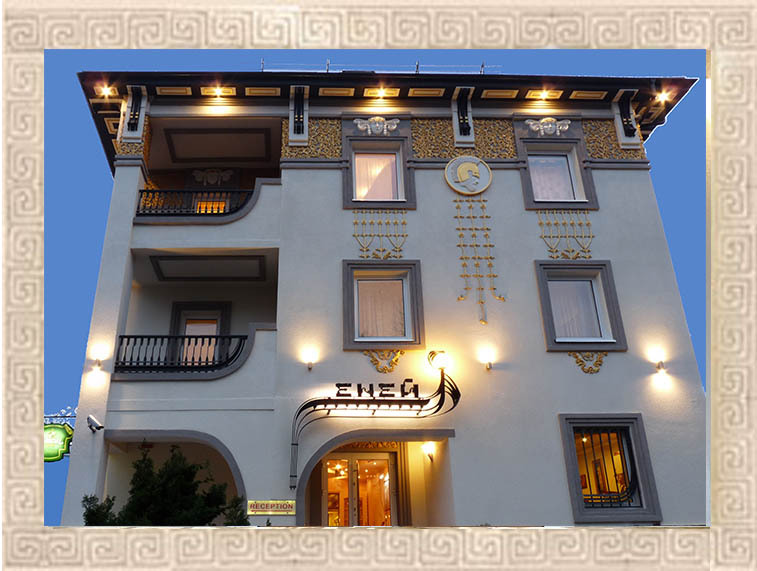 The hotel was built in the best traditions of Otto Wagner – leader of Vienna Secession. Outstanding Lviv architects were under great influence of theory and creations of Otto Wagner , but Lviv’s Secession was also relied on reach historical experience of Lviv. The number of characteristic signs of Secession decoration is widely used on a facade of hotel ENEY – free composed flat decor of floral or figural origin, characters of ancient Greece mythology, allegories, active bright golden elements. Hotel was named after Aeneas(in Ukrainian-ENEY) – glorious hero of a Troyan War, who is considered to be a founder of Roman empire, and his son Julus - ancestor of Emperors Dynasty of Julii. For Ukrainians Eney became known thanks to famous Ukrainian poet Kotliarevskyi, who has changed Virgil’s “AENEID” to Ukrainian style, transferring it into a real encyclopedia of Ukrainian folk life and transferring Aeneas into a Cossack and Ukrainian national hero.